last month I wrote A post on some cool CDs. 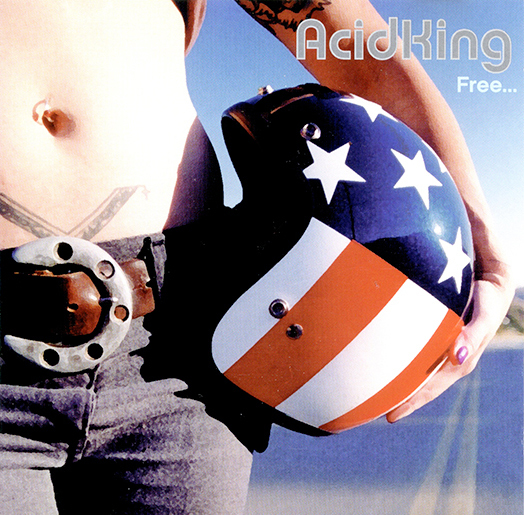 GuitarCave post #104 is all about Acid King — Free, which is actually a split of Acid King and The Mystic Krewe of Clearlight from way back in the year 2000. It’s some of the best Acid King there is and I dig it! Back in 2011 or so I wrote about Acid King’s Busse Woods disc in the Lovin’ It Loud post. This disc is more stoner rock than doom, at least when compared to Busse Woods. That doesn’t mean any heaviness or guitar wallop is sacrificed, no, no, no. The mix is a bit more spacious and the songs chug along at a nice brisk tempo. 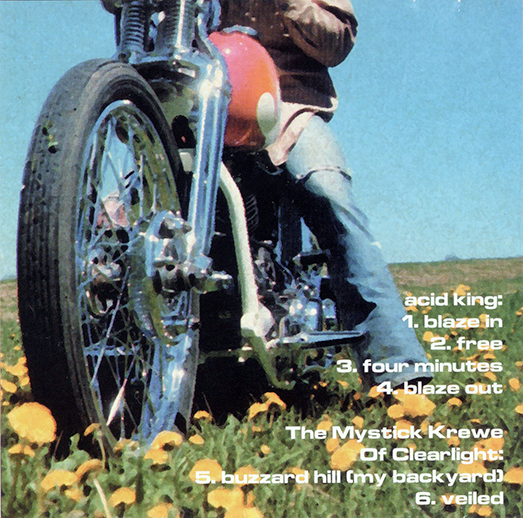 The pics of the bike and the helmet on the cover reflect the music — great driving and riding jams! And the disc art is pretty AWESOME! I started looking at it one day and when I stopped I realized it was another day. Amazing! I just listened to this CD the other day and realized that the 1st song on the split, Blaze In, (which is the same “theme” as the last song on the Acid King side, Blaze Out) is my favorite Acid King jam. Although it’s instrumental, the snaky, fluid guitar riffing is absolutely superb and the rhythm section of Guy Pinhas and Joey Osbourne just chug along like a pair of crash monsters should. I really love the RIFF and always have. When it kicks in Acid King sounds like a Metal Symphony. A close second favorite jam is the other brilliant song on the disc, the title cut, Free, a total ROCK ANTHEM, and if you’ve never heard it, you should just go listen to it on YouTube. It embodies everything I like about the band — great music and the guitar and vocals of Lori S. are really magnificent! I don’t want to say she is underrated as a guitarist, but she certainly deserves more attention for her skills that’s for sure. The third song 4 Minutes is the dark and DOOMY number of the disc. Great detuned guitar tone on this number whoa! HeAvY!! Great drumming too…this song really reminds me of High On Fire. Then, as I said the initial “theme” [Blaze Out] is repeated to close out a very fine and tight rockin’ disc ladies and gentlemen. If you are like me, you’ll find that this is exactly the right amount of time — not too much or too little — so that when the last song ends, your finger will already be hovering over the repeat button. I played it about 4 times in a row…I was rockin’! The other half of the disc that features The Mystick Krewe of Clearlight is ok, but nothing special. I’ve given it a few chances over the years and it never really grabbed me. I bought this disc from Man’s Ruin back in the day with a bunch of other stuff; some of it great, some not. By 2002 the label had imploded and many of the bands from back then have long since faded away. Acid King is one of the few (along with High on Fire) who went on to bigger and better things. I guess that is two (??) reasons this disc is another in-demand item on discogs.com but I’m glad to have it and will keep it. If this is up your listening alley and you ever have the opportunity, definitely pick it up!